The markets opened higher (well... As always on Monday...) making another new rally high. The rest of the day was kinda boring since the indices moved mostly sideways. The Dow and the SPX closed higher while the Nasdaq was weaker and closed lower. I didn't find any time to write the weekly update for the SPX so sorry about that. 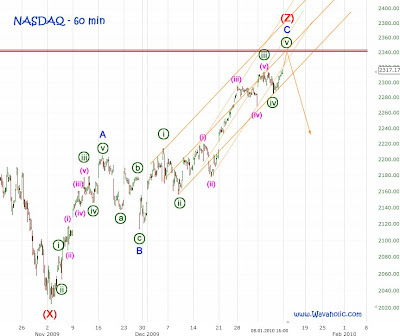 But since the Nasdaq count looks much clearer at the moment anyway I prefer to follow the Nasdaq. The magic numbers stays at 2285.23, the wave [iv] low. As soon as the market falls below that level I think the correction or even a new downtrend has started.